When you walk into a gun shop and gaze upon a sea of black, polymer-frame handguns on the other side of fingerprint-opaqued glass, the colors of the Taurus Spectrum, especially on the slide’s grasping surfaces and front- and backstrap panels, are truly distinct. In a crowded monochromatic marketplace, a splash of color draws the eye, no doubt. Some have difficulty looking past the surface. Despite the jibes, perhaps rightly (some thrown by me), Taurus has taken on the View and the Curve—remember this is the same innovative company that gave us the Judge and was a leader with Millennium 9 mm Luger and .45 ACP pocket pistols. 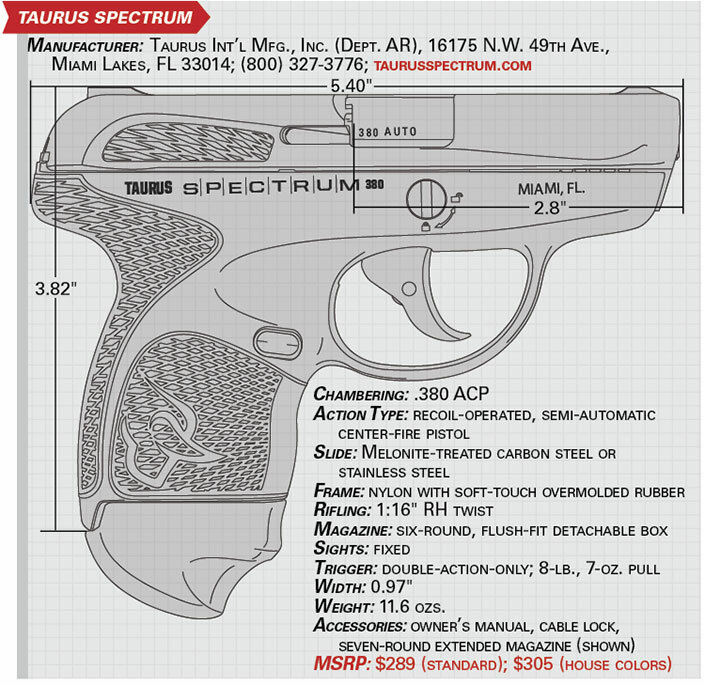 Taurus was also one of the first makers to offer a polymer-frame subcompact in .380 ACP, the TCP. While everyone was talking about the Spectrum’s color schemes, they missed the non-aesthetic features that make this gun mechanically interesting. And they missed the changes at Taurus in the United States that made the Spectrum possible. Although Taurus revolvers and many of its pistols are made in Brazil, the Gun Control Act of 1968 mandates that small, concealable guns be made in the United States. So, because the Taurus Spectrum cannot amass enough import points, it is made here. But that’s not the only reason. Taurus knew the TCP was due for an upgrade and commissioned a study on ergonomics. The end result was the use of elastomers not commonly found on firearms. Taurus worked with what is arguably the top company in the world in that field—PolyOne—to find a synthetic material that was soft yet tactile enough to be held onto while firing—all without “sticking” to one’s clothing. That is the material that you see across the front- and backstraps and where one would normally find rear slide serrations. It is an innovative approach that re-imagines how both the weak and strong hands interface with the pistol, and Taurus calls it Soft-Touch Overmold. Also, it helps dissipate perceived recoil, as the overmolded elastomer is softer than the nylon frame. The panels are chemically and mechanically bonded and unlikely, if not impossible, to separate. 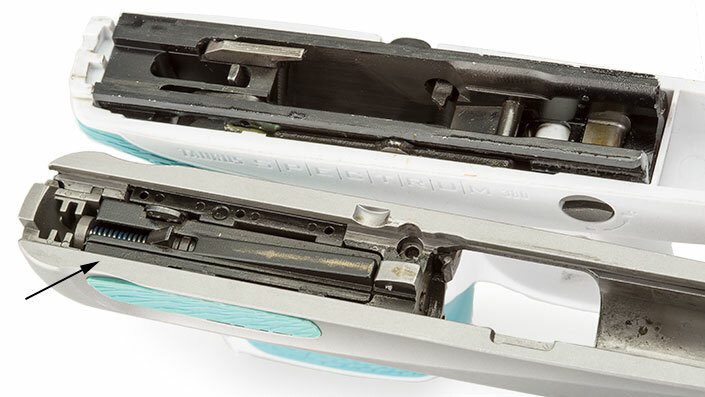 The recoil-operated, double-action-only Spectrum has Soft-Touch Overmold panels on its frame’s frontstrap and backstrap, as well as on the slide (l.). The barrel (below r.) locks into the slide’s ejection port, and there is a High Power-style cam underneath. Disassembly is accomplished by using a screwdriver to turn the takedown pin (top, r.) to the unlocked position. Taurus has become a very different outfit from even a decade ago and is now under the same parent company that owns CBC and Sellier & Bellot. It no longer makes every gun part itself. A culture shift occurred, with other changes ranging from new logos to making the website usable (you can now actually order a Taurus magazine without waiting for customer service to answer the phone). And Taurus changed the entire firearm industry a few years ago when it dropped the price of a 9 mm Luger Millennium G2 to about $200 at retail. It didn’t hurt that quality control improved in Brazil, too. Taurus USA now has full-time design engineers who formerly worked at places such as FN, Remington and SIG Sauer. This is significant because, previously, almost all new Taurus designs came from engineers in Brazil. Having American gun enthusiasts designing guns Americans actually want to buy is a sea change for Taurus. This gun was designed and is manufactured in Miami (although Taurus is set to move operations to Bainbridge Ga., this year). It is the first gun—start to finish—designed and made in the United States by Taurus. The Spectrum is striker-fired, but its striker is not preloaded. When the trigger is pulled, the tail of the trigger bar retracts the at-rest striker to its full length of travel then, as the bar continues to pivot rearward, it releases the striker to go forward and hit the primer. Frankly, it is a very simple and reliable system, and the only downside is the trigger pull. This is a true double-action-only pull, and the trigger resistance is provided not only by the striker spring, but also by the mousetrap-style trigger return spring beneath the trigger. This adds up to a trigger pull of about 8 lbs., 7 ozs., but the design does allow for second-strike capability. The striker assembly is contained within a separate striker housing (arrow) that interlocks with the polymer slide inserts and a metal slide cap. An aluminum chassis, the actual serialized part, is inset within the polymer frame. It retains two groups of parts: the trigger, the cam pin for the barrel’s underside travel and the takedown pin at the front; and the ejector and passive firing pin safety at the rear—the trigger bar inside the frame’s right side links the two. The frame also provides 3.38″ of internal rail for the slide, and the serial number can be viewed through a port on the grip’s left. The polymer magazine release, which is reversible for lefties, is on the frame’s right behind the trigger, and it bears a similar oval checkering pattern as the grip frame. Ejection is by a fixed ejector on the frame’s left, while an external hook extractor is on the right rear of the action port. The gun has a slide lock on the frame’s left (albeit a small one), and the slide does lock back on an empty magazine. The slide lock makes the gun measure 0.97″ across. The slide inserts do more than just provide a gripping surface (grooved on most guns)—they are actually integral to how the gun is made. Traditionally, a slide is made with all the recesses for the firing pin, its spring, firing pin safety, etc., from one piece of steel. But what if you didn’t have to machine firing pin channels the whole length of the breechblock? That’s exactly what Taurus engineers tackled at the rear of the slide with subassemblies. The breechface is machined integrally with the slide, but behind it lies a recess for the carbon steel striker housing. The striker is inserted into the rear of the housing, then an interlock system uses the slide inserts to dovetail the housing in place. It is all held together by a separate steel cap at the slide’s rear. It might sound complicated, but it greatly speeds and simplifies the slide’s manufacture. Disassembly is another area in which the Spectrum was designed for ease of manufacture—and external footprint reduction. There is no external disassembly lever, rather the steel takedown pin in the frame above the trigger has a concave face with a slotted surface on its right side. The frame itself has pictographs of locked and unlocked padlocks. With the magazine removed, and after making sure the chamber is empty, use a slotted screwdriver to rotate the pin upward 90 degrees. The slide can then be removed off the front of the frame with no need to pull the trigger. 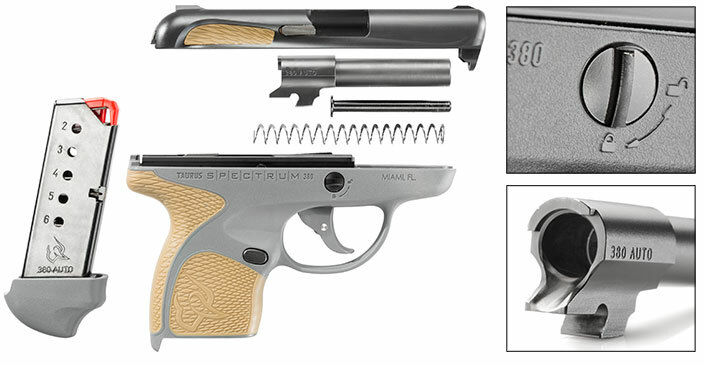 Simply re-installing the slide causes the pin to rotate back into the locked position under pressure from the recoil spring and its guide rod. Speaking of the recoil spring, it is a flat coil spring surrounding its steel guide, and reassembly takes some hand strength. How guns are introduced has changed. I pin it on Ruger. The company that used to show guns long before they were ready—sometimes years—literally had tens of thousands of LCPs in distribution channels when it flipped the announcement switch. That is the new norm. When a company doesn’t have guns available the minute you hear about them, there’s speculation about what is wrong with the gun. At the 2017 SHOT show, Taurus’ booth was lit up like a Technicolor rainbow with the new Spectrum. Interestingly, engineers, some of whom I’ve known for years, would not let me disassemble the guns. And that’s because something wasn’t ready on the inside. Initially, Taurus had hoped to metal injection mold (MIM) the slide. While there is a lot that can be done with that process, in the end Taurus opted to machine the slides. That said, Taurus engineers tell me they are hopeful that, eventually, they will indeed be able to MIM slides. Today, depending on what color you are buying, the slide will either be machined out of stainless billet or Melonite-treated carbon steel. The basic black Spectrum, the Henry Ford gun, if you will, arrived at our offices in January 2018, a full year after launch, while the colors took longer. There are three basic frame colors—white, gray and black—two slide finishes and 20 overmold color options. In my view, no colors, no story. The first black-and-gray gun arrived in April, followed by a full crop in white, gray and black in September, and that’s when I greenlighted this story. The Spectrum was announced prematurely, as there were issues that Taurus engineers did not foresee in terms of slide construction and getting the frame and insert colors right. Not offering a gun until it is ready should not be cause for a flag on the field. You might lose momentum, but waiting until the guns work as intended can prevent a train wreck. Three different Spectrums were fired to the tune of about 550 rounds with not a single malfunction. That said, this is a gun that requires a strong grip—don’t limp wrist it. 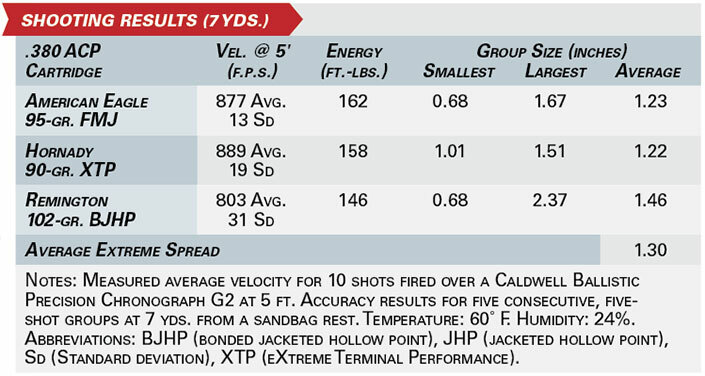 We fired the black-on-black gun for accuracy at 7 yds., and the results are tabulated below. The little gun points extremely well, and proved surprisingly accurate. The use of the seven-round magazine with the pinky extension makes the gun eminently more shootable, although less concealable. In the hand, the overmolding helped with the snappy recoil, and aided the gun staying in a proper shooting grip even in rapid-fire strings. Discharging the Spectrum is a very deliberate act. There is no manual mechanical safety or trigger blade safety. The weight and length of the trigger pull are there for a reason, and that is to help prevent unintentional discharge. That long, heavy pull can be mastered, it just takes practice. Sights are fixed and rudimentary, reminiscent of guns from another era, and there is no foreseeable way to upgrade them. That said, they are unlikely to snag on anything because there isn’t enough there to do so. The gun rode well in a Galco pocket holster, drawing and presenting smoothly—just as intended. It remains to be seen whether consumers are still actively interested in a gun like the Spectrum—especially in light of the affordable 9 mm Luger pistols on dealer shelves. Is there still room for a new micro-compact .380 ACP with a double-action-only trigger? It depends, and mostly on cost, as quite a few guns in this category are competitively priced between $200 and $300. Spectrums in “Standard” color offerings have a sticker price of $289, while the glitzier models will cost a little more—“House” colors coming in at an MSRP of $305. That said, I have seen the basic black gun, and others, displayed and priced far below retail. No one should ignore the fact that firearm selection is a very personal choice, and the Spectrum offers a level of personal expression like no other. This is not just a gratuitous use of color, and I have friends drawn to the Spectrum for the unique color combinations it offers—folks who otherwise would not have given the Taurus a second glance. In many ways, though, the Spectrum’s pigmentation is tertiary. The company already has new U.S.-designed projects in the pipeline, guns that will be made here. The Spectrum is just the beginning.